Infelix Ego: Why all the fuss about this place? If there is one word guaranteed to set the ageing renewalists aglow with gushing enthusiasm, it is Taizé. Taizé is the centre of their religious universe, as Mecca is to the Mahometan. Melancholicus was tidying up his room the other day and came across a newsletter from the local parish, the front page of which promoted this phenomenon with warm approbation. Melancholicus reproduces this blurb here for the benefit of his readers, and has taken the liberty of inserting a few barbed and sarcastic remarks in red. The above description was given by the great Pope John XXIII [there is no doubt that John XXIII was very popular, but popularity hardly suffices to make one great. Ah, but silly me, John XXIII is great because he convoked Vatican II and so is the source of the wonderful renewal we are now experiencing in the Church today] referring to the Ecumenical Community of Brothers based at Taizé in France. The community was founded by Roger Schutz a Swiss Lutheran over fifty years ago. The community was visited by the late Pope John Paul II as well as the present Pope, who visited it as a Cardinal. Both praised it as venture to reach out to all people and particularly young people [emphasis mine] who visit the community in their hundreds [what, not thousands, as has oft been claimed?] and join the community of brothers in their prayer life and sharing of the Christian message. Brother Roger died in 2006 [there is considerable divergence of opinion as to whether Brother Roger died in 2005 or 2006. Maybe there were two Brother Rogers, one of whom is rumoured to have been a closet Catholic. Perhaps one of these Brother Rogers was the public figure and the other was kept hidden away in a dungeon out of sight. If we come across any photographs of Brother Roger purporting to have been taken in 2006, perhaps we should look closely at his ears] and has been succeeded by Brother Alois as head of the community of around one hundred brothers of various nationalities and denominations [the fact that these 'brothers' come from a large variety of sects—some are even Catholic!—is seen as one of the most wondrous aspects of this place. It is the ultimate ecumaniacal paradise]. If anyone wants to know more about this unique community they are invited to meet Brother Alois and some brothers who will be in the Pro-Cathedral on Friday 25 April at 8pm. They may even be tempted to visit Taizé and experience their very moving prayer gatherings and meet others who have been touched by this «little springtime» in the church [sic]. Melancholicus missed Brother Alois’ visit, but has not lost any sleep as a consequence. I suppose the fellow was generously fêted at the pro-cathedral, and I dare say that in the run-up to his arrival parishes all across the diocese were active in love-bombing “the youth” (or what little youth they have left) in an attempt to bestir their interest in meeting this towering celebrity. For some reason that Melancholicus cannot quite fathom, the henchpersons of newchurch always seem to regard Taizé as especially relevant and appealing to “the youth”. Is this simply because as a phenomenon Taizé is a radical novelty, something totally untraditional, and hence buys into the patronising notion that young people are so shallow they will prefer the new simply because it is new? What makes Taizé particularly dangerous—and hence totally undeserving of the promotion it receives from our parish clergy and religious—is that it is probably the one place on earth which most tangibly embodies the ecumenical lie. I refer to the notion that the unity of the Church does not actually exist, hence we have to go in search of it, along with our “separated brethren”, who are viewed by adherents of the lie as equal partners in the search for this “lost” unity. To put it simply, if Taizé is so cool, what’s so special about being a Catholic? 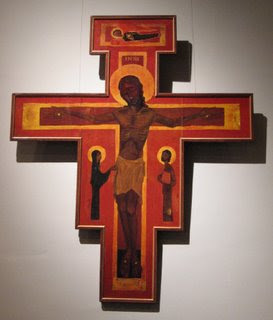 The Taizé people aren’t Catholic (or if they are, they haven’t told us yet), but in spite of this they are praised to the skies by our fathers in God, as though Taizé holds the key to the cosmos. What lies at the bottom of this ecumenical search for “unity” is not unity at all, but universalism. Our young people are exhorted by the wild-eyed hippies that run parishes and religious orders to make pilgrimages to this place, effectively placing it on the same level as Fatima or Lourdes or even Rome itself, and in so doing, whatever faith they might beforehand have had in the singular importance of the Catholic Church is lost entirely. But even if the Taizé community were a normal Catholic religious order—which it isn’t; as they say in Yorkshire, it’s neither nowt nor summat—Melancholicus would still object to its relentless promotion by the doyens of the new religion, and that simply because of its second rate tat. Take a look at their crucifix, for instance. Gaudy, garish colours; badly-proportioned figures with spindly limbs, evoking more than a whiff of the grotesque; mediocre artwork of a fairly middling standard; the odd shape of the thing, and not least, its propensity to be copied and mimicked in churches and parishes without number all over the world. Look at the photo of the sanctuary of the chapel here at the university where Melancholicus earns his living (in this post below), and you should notice a familiar-looking object adorning the wall behind the Lord’s board. Now look at this thing, by which I mean the object she’s sitting on. They call it the “Taizé kneeler”, but it isn’t a kneeler really, is it? It’s actually a kind of stool. 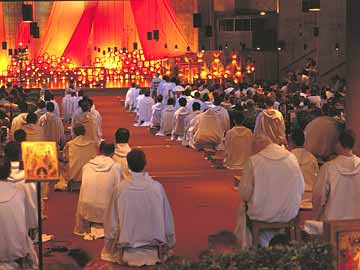 The weight of the body in this position is borne not by the knees (as in classic kneeling posture) but by the buttocks, hence the Taizé version of kneeling is really nothing other than sitting. At best it can be described as lazy man’s kneeling. The goal of this posture is not to abase oneself in humility before the majesty of God, but to achieve ‘relaxation’ à-la New Age, with a veneer of prayer. This attitude is fed by the Taizé style of prayer, in which mantras are chanted over and over with the aim of soothing the participants, inducing emotion or a kind of trance-like stupor more reminiscent of a guided relaxation session than genuine prayer. And as for their music, well, I cannot praise it. Chemical weapons have oft been described as “the poor man’s atomic bomb”. In that vein, we might describe Taizé singing as the poor man’s gregorian chant. Melancholicus has never cared for it, even in the days before his discovery of Tradition. It has always seemed to him to be contrived and vaguely embarrassing. Why have Taizé chant when, with a little effort, one can have the real thing? Why be content with hamburger when one can have filet mignon? Far from being a “little springtime”, Taizé, much like Focolare, the neo-catechumenal people and various other fads of the hour, is a weed rather than a flower in the vineyard of the Lord. Some weeds are quite attractive, sporting pretty petals and flowers of pleasing hues. Those unlearned in botanical matters may mistake these weeds for something the Gardener has carefully cultivated, when in reality they are invasive intruders, having installed themselves without His assistance, limiting the growth of other plants by blocking out the light and by using up nutrients from the soil. They have pretty flowers, emit a delightful perfume, wave pleasingly in the breeze, and look to all appearances like a well ordered flowerbed—but the vine, starved in soil rendered barren by their aggressive proliferation, begins to die. Weeds do not serve the Gardener; neither do these ‘movements’—least of all Taizé, which isn’t even Catholic—serve the Church.